Other Tests: Junkers EF 128 / Ruhrstah/Kramar X4 AA. The versatile Junkers Ju 88 was used in many rolls by the Germans. A number of them were located at the Lufthansa facilities at Satan for use by engine manufacturers to evaluate there prototype engines. The aircraft at the top of the page and to the right is a Junkers Ju 88 A4, the aircraft is fitted with a Junkers Jumo 004, it's interesting to see that the engine is not fitted with a cover. In the beginning of 1945 a fuselage of the Ef 128 complete with a Heinkel He S 011 engine was fitted piggyback to a Junkers Ju 88G Mistel fashion for testing of the air intake design. 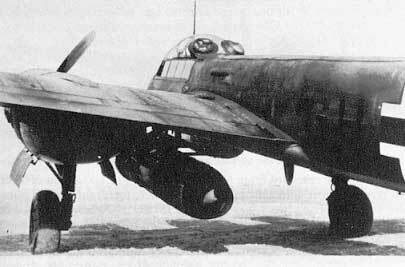 The Ju 88 was also used to successfully test fire the Ruhrstah/Kramer X4 Air to Air guided missile in late 1944.